I talk a lot about service. Because I believe in making a difference, I believe in helping people, I believe in compassion and kindness. I believe that service is a two way street, a you help me and I help you kind of thoroughfare. A million years ago, I was a lonesome young girl battling a few demons, quickly slipping into a depression (before it was a common word/diagnosis). I was a punk/goth wannabe in the early 1990s stuck in Lincoln, Nebraska thinking nobody understood me. Certainly not my roommate "Ronda without the H" from a little house on the prairie. I was not only lonesome, I was miserable and judgemental. I walked around the campus of University of Nebraska with my purplish hair, black boots and bad attitude, Temple of the Dog blasting through my Walkman. Broken and bitter and lost. It was a moment, an intersection--a choice had to be made. I wanted out of the black hole of depression. I felt desperate. I called a hospital in the area. I called to ask if I could help out. I needed to get out of my head, get out of my sorrow, get out of my feeling of being utterly useless and unworthy. At the hospital, I put on my pink polyester jacket and sorted mail, stapled hospital newsletters with Mabel, Ruth and Evelyn (my new best friends that were like my personal Golden Girls), wheeled patients to and from appointments, and delivered flowers. I was helping people and they were helping me. It truly changed my life. Over the years I've had paid jobs and volunteer jobs with organizations like the Red Cross, the United Way, Pittsburgh Cares, Meals on Wheels and more. My life has been full of ups and downs, twists and turns, emotional and hormonal imbalances....but the lessons I've learned through service have sustained me. Service has taught me not only to get out of my head and my own sorrow, it has taught me lessons about compassion, empathy and humanity. 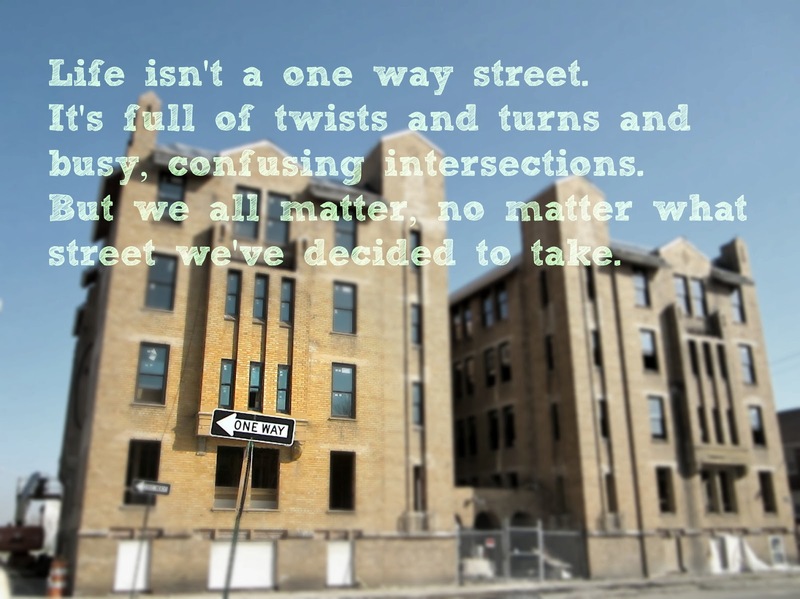 Service has taught me that we all matter, no matter what street we've decided to take in life. Since becoming a mother, my urgency to help others only grew--relating to those mothers and children in crisis with my whole heart every time I looked into the eyes of my own children. However, the opportunity to serve gets a little more challenging with babies. We tried a few service/volunteer trips without much luck. Some people are really good at making it work with little ones, I am not those people. But now that two of my older kids are, well older, we are jumping at the opportunity to serve. 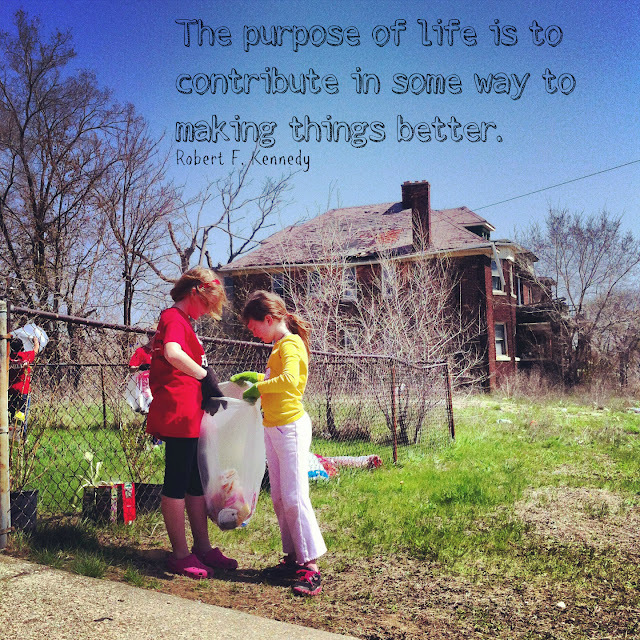 This past weekend, Lucy and I went to Detroit (just about a half hour away from our home) with our church to volunteer at an amazing nonprofit called Cass Community Social Services (CCSS). CCSS works in areas of concentrated poverty providing programs for food, health, housing and jobs. They prepare and serve one million meals every year. Almost 300 homeless men, women and children currently stay in one of the shelters, transitional housing or permanent supportive housing programs. CCSS operates a weekly free medical clinic and a day program for 100 adults with developmental disabilities. Over 70 adults are currently employed in the agency's Green Industries. It's truly unbelievable the good that this organization is doing in a city that needs a lot of good right now. Lucy and I went to help paint and plant. I was so impressed with Lucy and the other kids that came on the trip, they were there to work. But just like anything with kids, laughter and silliness ensues. And that's what I love about kids. On a street where many of my suburbanite neighbors would be afraid, our kids were running through the hose water and dancing and telling stories. They were also thoughtful and respectfull of the residents of the house we were painting. They were curious. They were interested. They were full of compassion and empathy. Here's a short video I made about our visit to CCSS. St. Paul's Trip to Cass Community Social Services from Jumping With My Fingers Crossed on Vimeo. 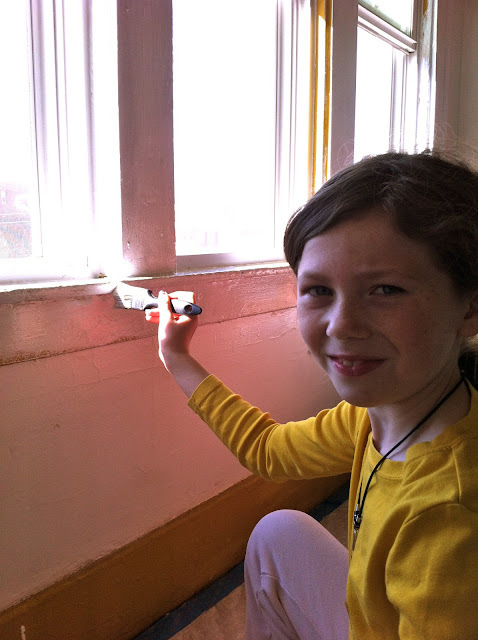 When we were getting ready to leave, Lucy was all rosy cheeks, freckles and hope and happiness and love. "When can we come back?," she wanted to know and then she laced her fingers with mine. Later we talked about how the residents ended up living in the house we were painting. She asked questions about what she called their "back stories." I honestly told her I didn't know everyone's story but imagined that it could've been a lot of little things that led them there. She listened as I explained my "life's not a one way street" analogy, how there are so many intersections and stop signs and wrong ways and under construction signs to get through. She gazed out the window only halfway listening. I knew I was using way too many words. Lucy summed it up best anyway when she said , "I loved making friends today, my heart feels all full." CCSS's Cass Industries just started an awesome new project: building and selling coasters. 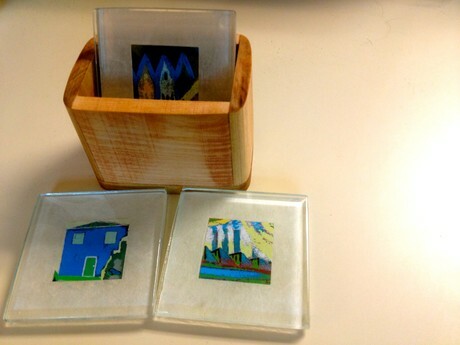 These coasters are made from recycled glass and feature images of graffiti from Detroit's "wailing wall." This half mile concrete wall was constructed in August 1941 to segregate a Detroit community in order for a white housing development to receive funding. CCSS says they are hoping the "coasters will not only look great in your home, but also spark discussions about overcoming segregation." The boxes that hold the coasters are made from refurbished wood, and made by homeless people that work at Cass Industries. The coasters sell for $20 and can be purchased by calling (313) 883-2277. Go buy some for sure, but I'm giving a set away. Click here to hear a great interview with the executive director of CCSS Reverand Faith Fowler about Detroit's Wailing Wall on the Craig Fahle Show. To win a set of coasters leave a comment below or on my Facebook page about how service has changed your life and/or if you've done any volunteering projects with your kids and/or leave a comment/link with the organization you feel passionate about. I'll pick a winner on Thursday. Angela - SO well said! YOU are AWESOME!!! Love you, girl - can't wait to go back down to Cass with the kids! JoAnn XO! !